Wireless internet lets you watch or browse from anywhere…as long as your Wi-Fi network works well. Because Wi-Fi depends on radio waves from your wireless modem, anything that or blocks or interferes with those waves could mean trouble for your connection. We’ve gathered some common causes for wireless network struggles and what you can do to resolve them. Where you put your wireless modem is very important. Wireless signals are only capable of traveling a short distance. Even if your computer, tablet, phone, or other device is within “range,” the farther it is from your wireless modem, the slower your internet connection will be. The signal is weakened by whatever it has to travel through in order to reach your connected devices. If your modem is on the floor, under a desk, in a closet, behind fish tank, or near an outside wall, a lot of the wireless signal will be absorbed by obstructions instead of being available for you to use. If you want wireless to work everywhere in your house, it is best to locate the modem in a centralized location. If you have a smartphone, you can use it as a tool to “see” your wireless network. Walk around your house with your phone connected to Wi-Fi and keep an eye on your wireless signal strength indicator. Any area where you lose connection bars is a weak spot. You can try to improve your wireless signal by relocating the wireless modem or moving obstructions—and then use your phone to check the signal before and after the changes to see if there is any improvement. For even more precision, there are smartphone apps available for Android and signal analytic tools for laptops that will give you an actual signal strength reading in dBms. A strong signal read would be in the neighborhood of -40dBm. A low reading—where you will have connection trouble—would be around -80dBm. Not every home has an ideal spot to centrally locate a wireless modem, and some homes may require a larger Wi-Fi coverage area than is ideally in range. In these cases you may want to purchase a wireless extender or repeater. This is not unlike like getting an extension cord for your wireless signal—since you can’t bring the devices into better range of the signal, you can bring the signal closer to your devices. You can check with your local electronics retailer to see what would be the best option for your needs. One of the reasons Wi-Fi is so great is that it allows you to move around with your device and still have Internet access. However, if you have devices that don’t ever move, consider using an Ethernet cable to physically connect them to the modem. As great as Wi-Fi is, using a physical cable is faster and more reliable. You can buy longer networking cables from a variety of stores. There may be other items in your home that interfere with the wireless signal. Common examples include microwave ovens, cordless phones, Bluetooth devices, baby monitors, and wireless game controllers. If these are the source of your trouble, you’ll notice problems with your Wi-Fi connection when the item is in use. For example, if your microwave causes interference, it will only be when you’re heating up dinner. 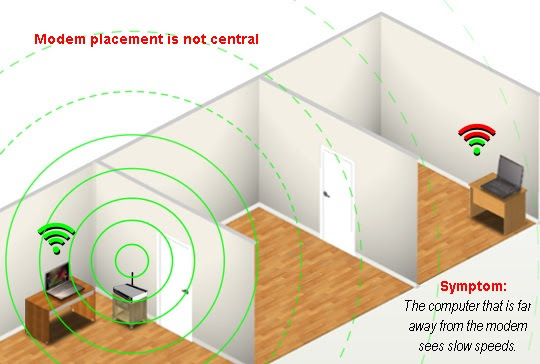 Once you identify cause(s) of interference you can either move that item, choose not to use that device when you are also using the Internet, or try relocating the modem. Another solution would be to use a corded connection for the device experiencing interference. Another potential source of interference could be your neighbor’s wireless network. This is another good reason to do your best to centrally locate your modem—doing so helps minimize channel conflicts. Your Wi-Fi network speed will only be as fast as your slowest device. Those that use older Wi-Fi technologies will cause your wireless network to slow down to a lower speed so they can connect. If you have any devices that use the older wireless standards (as of September 2015, these would include Wireless- A, B, or G) on your network you will likely notice range and performance issues while using them, plus they will keep your newer devices from running at full speed. If you ever wanted an excuse for a device upgrade, maybe now you have one ;-). Room images created by TDS with a little help from the Autodesk Homestyler at Homestyler.com. Kids spends how much time online?